A CBC Marketplace investigation has found worrying levels of antibiotic-resistant bacteria on imported shrimp bought at major grocery stores across Canada. Global demand for shrimp has exploded in recent decades, worth an estimated $39 billion US and growing. Canada alone imports about $700 million in shrimp every year, with the majority of it coming from countries like India, Vietnam, China and Thailand. But as our hunger for shrimp has grown, the way it is brought to our plates has greatly changed. Today, much of the world's shrimp is farmed, often grown in crowded, shallow ponds that can harbour disease. That's why Chef Rob Clark believes it's tough to buy quality shrimp at the supermarket. Clark is the chef behind The Fish Counter, a Vancouver-based market and eatery focused on sustainable seafood. And when it comes to shrimp, Clark says he hasn't eaten an imported shrimp in probably 20 years. "They could be filled with pesticides, antibiotics, insecticides — they're grown in cesspools." Although the Canadian Food Inspection Agency (CFIA) does not allow for the use of any antibiotics in shrimp farming, the overuse of antibiotics in Asian shrimp aquaculture has some researchers concerned about the potential for antibiotic-resistant bacteria landing in Canada through imported seafood. To test for the potential of antibiotic-resistant bacteria, Marketplace bought 51 frozen shrimp products from major grocery stores in Calgary, Toronto, Saskatoon and Montreal, and sent them to a special lab at the University of Saskatchewan for analysis. Nine of the products — or 17 per cent — were found to be carrying bacteria, such as E. coli and staph aureus, that showed resistance to at least one antibiotic. All but one of the bacteria were resistant to multiple drugs, meaning they have the potential to cause hard-to-treat infections — so called superbugs that antibiotics may not be able to kill. In an email, the Public Health Agency of Canada (PHAC) told Marketplace the results were "of concern" as the resistance genes found "can move between bacteria." So even if the bacteria does not normally cause human infections, PHAC says, there is "a risk that the genes could move to bacteria more likely to cause infections." Antibiotic resistance has been called one of the biggest threats to global health by the World Health Organization, with an estimated 700,000 people dying globally every year from antibiotic-resistant illnesses. A 2014 study by researchers in the U.K. further warned that, if left unchecked, the spread of antimicrobial resistance could lead to more deaths than cancer by 2050. Bacteria naturally develop resistance when they are exposed to antibiotics, but researchers say the misuse and overuse of the drugs in both health care and the food chain has accelerated the spread of resistance. It's a warning that rings all too true for Wendy Gould. 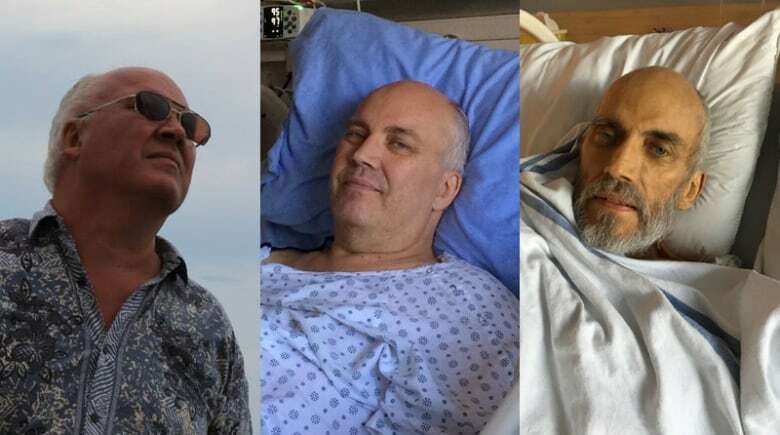 Her husband, George, already fighting colon cancer, picked up a superbug from a contaminated endoscope while at a hospital in British Columbia. It took months for doctors to diagnose the problem — a virulent strain of E. coli called New Delhi metallo-beta-lactamase-1. Despite attacking the bacteria with antibiotics so powerful they caused George to hallucinate, the infection remained. George was hospitalized 23 times in a little over a year, becoming too sick to continue cancer treatment and too weak to eat. He ultimately passed away in January 2018. Gould felt powerless watching her husband slowly waste away. "You could have all the best doctors in the world taking care of you ... but if you get one of these infections, that's it," she said. 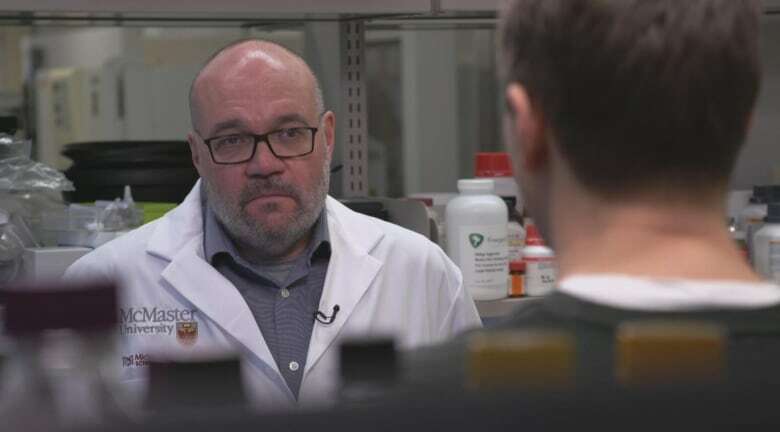 That's why Dr. Gerry Wright, an infectious disease expert at McMaster University, says we should be very concerned about superbugs showing up in our food chain. "I'm terrified by this stuff. Multidrug resistance is probably the biggest threat that we have to modern medicine in the 21st century," he said. "Every time you have a knee replacement, any kind of surgery, cancer chemotherapy, if you have anyone in your extended family that's had a premature baby, they all rely on antibiotics because their immune systems are weak." And if we can't turn to antibiotics, Wright says "all of what we consider to be modern medicine becomes incredibly risky." The Marketplace tests, conducted at the Rubin Lab at the University of Saskatchewan by associate professor and antimicrobial resistance expert Joseph Rubin, found MRSA — a multidrug-resistant staph aureus — on two of the shrimp products. 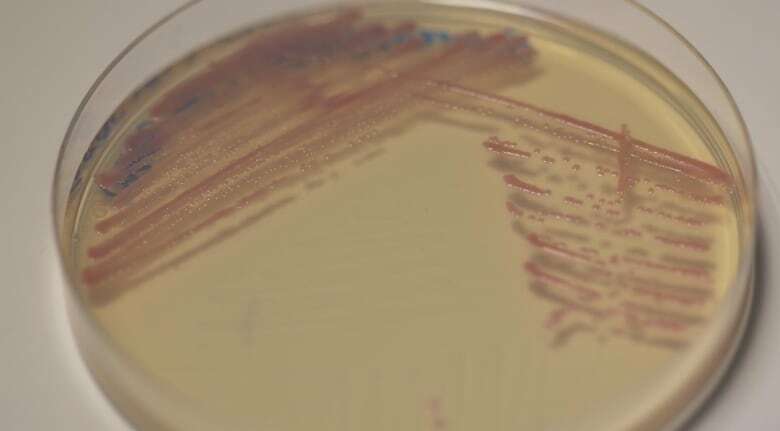 The staph aureus bacteria was possibly the result of human handling during processing, according to Wright, however he warns that "MRSA should not be showing up in food." Of great concern to both Wright and Rubin was finding the presence of something called ESBL on three of the shrimp products. ESBL-producing bacteria can create an enzyme that prevent antibiotics from working. These bacteria can also pass that predisposition onto other bacteria, meaning that if they invade your body, the ESBL-producing bacteria could affect the other bacteria that normally live in our systems, potentially making antibiotics we take ineffective. And if you think turning to certified or organic seafood could help, Marketplace's test showed these products aren't immune. Six of the nine samples that tested positive for antibiotic-resistant bacteria had Global Aquaculture Alliance's certification for Best Aquaculture Practices (BAP) stamp of approval on their packaging, meant to indicate that product has been farmed to a certain standard, including limits on antibiotic exposure. When it comes to organic, one of the four organic products tested positive for ESBL-producing strains of bacteria, as well as multidrug resistant to three different antibiotic drug classes. When contacted by Marketplace, both the Global Aquaculture Alliance and the shrimp companies involved said their shrimp are safe when cooked properly, as any bacteria will be killed off. 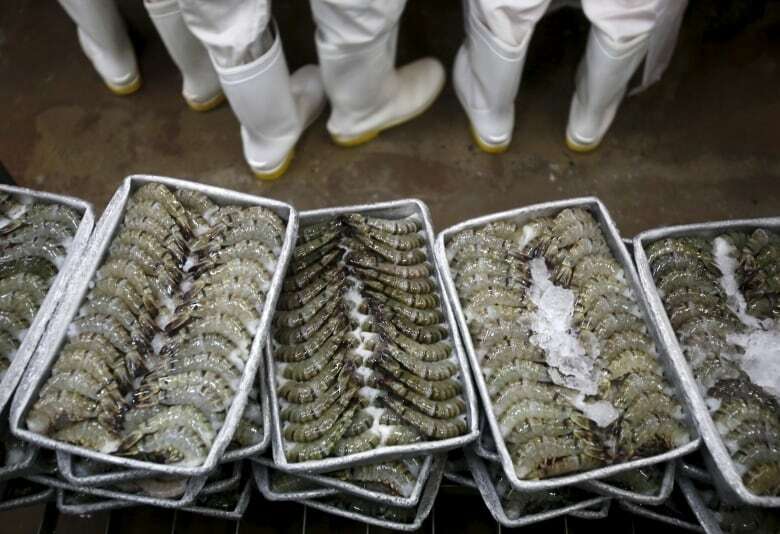 Some companies said the antibiotic-resistant bacteria could have resulted from contaminated soil or water, or from shrimp processing and handling. While fully cooking the product should mitigate the risk, Rubin said live antibiotic-resistant bacteria, like ESBL, can be particularly concerning if eaten. "Antibiotic-resistant bacteria, if ingested, can have the potential to share resistance genes with the other bacteria in your gut," he said, as antibiotic resistance can build up over the long term. According to Marketplace's test, one country, more than the others, had positive results for antibiotic-resistant bacteria: India. Five of the nine positives came from there. Canada imports more shrimp from India than any other country: 15 million kilograms in 2018 alone. But India's population also consumes more antibiotics than any other country, increasing usage by a staggering 103 per cent since 2000. Concern over the widespread use of antibiotics reported on farms in India has resulted in the EU imposing a strict 50 per cent inspection regime on shrimp imports from the country. And the U.S. is currently rejecting near-record numbers of shrimp from India. 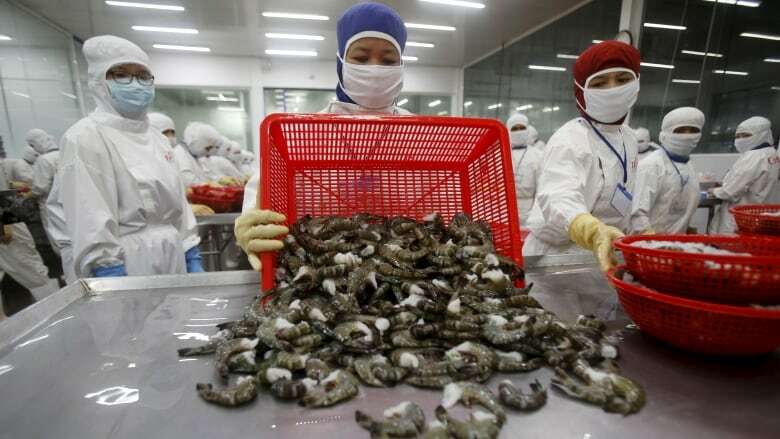 It is difficult to know exactly how the shrimp tested by Marketplace acquired the antibiotic-resistant bacteria; while the UN FAO says antimicrobials are "commonly used" in Asian aquaculture, it is possible that bacteria can develop antibiotic resistance from exposure to contaminated soil or water, or during processing and handling. Unlike chicken, pork or beef farming in Canada, where the use of antibiotics is permitted in limited circumstances, antibiotic use on farmed shrimp is banned by the CFIA for both imported and domestic products — a policy also followed by the U.S. and the European Union. While the CFIA does inspect the seafood coming into the country, including shrimp, the agency only tests about five per cent of imports. And inspectors are only testing for antibiotic residue — not antibiotic-resistant bacteria. If a shipment of shrimp is found with antibiotic residue, that whole shipment is rejected. But the fact that Canada isn't specifically testing for what kinds of superbugs might be coming into the country represents a "gap" in the war against antibiotic resistance that needs to be closed, says Wright. "This is a growing problem around the world. We need to come to grips with it and we need to get on top of it," he said. When Canada is importing food from countries known to not have the same restrictions on antibiotic use in agriculture and animal production, Wright says we should assume they're going to be contaminated. "Once these organisms are here, once these genes are in Canada, then there's no good way to keep them from spreading around. So what would be a really good idea is to prevent them from getting in in the first place," he said. "Pandora's box is open when it comes to resistance. We can't scrub the planet of this problem." Marketplace asked federal Health Minister Ginette Petitpas Taylor about what the government is doing to protect Canadians from antibiotic-resistant bacteria on imported shrimp. She said her department is concerned about antimicrobial resistance, and that she is "absolutely committed" to find out what CFIA testing is being done to make sure Canada's food supply is "safe for all Canadians."